Sixteen-year-old Rebecca Simpson, of Dame Alice Owens School in Potters Bar, has won a national competition to produce a creative photo connected to maths. Winning entry by Rebecca Simpson. The competition was run by Maths Inspiration, a great initiative that runs lecture events in theatres around the country, featuring speakers such as the writer and TV broadcaster Simon Singh. The competition, sponsored by Hewlett Packard, was open to all the 6,000 who attended the shows last autumn. 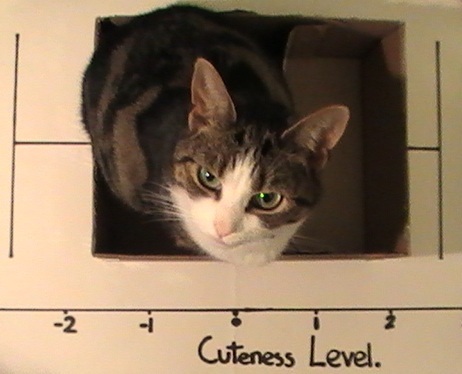 Rebecca's entry, entitled Box and whiskers, depicts a cat being measured for its level of cuteness. It's a play on box and whiskers diagrams, which will be familiar to any GCSE maths pupil. Rob Eastaway, the director of Maths Inspiration (and Plus author), said: "Our shows aim to prove there's more to maths than just taking exams, and humour is an important part of how we present maths. Rebecca's entry really caught the spirit of what we are trying to achieve". Rebecca wins £200 and a signed copy of the book Fermat's Last Theorem by Simon Singh, while her school receives two top-of-the range Hewlett Packard graphing calculators.